David Hewes: An Autobiography, 1913. "Lieutenant Joshua Hewes: A New England Pioneer and Some of His Descendants ..." by Eben Putnam, 1913. Note: You can search the chapter using the find command, even though the document will be displayed as original page images. The 1913 book, used a coarse printing screen which limits the legibility of the engravings (the above photo was digitized directly from an original copy of the 1913 book showing all of the resolution available in the printed copy). In 1937, Professor Robin Lampson found David Hewes' trunk which had been passed down in the Hewes family containing the May 4, 1869 Hewes receipt for two gold spikes, and photographs including the following (now at the University of the Pacific) which only shows two sides clearly and an additional side that can be partially read. 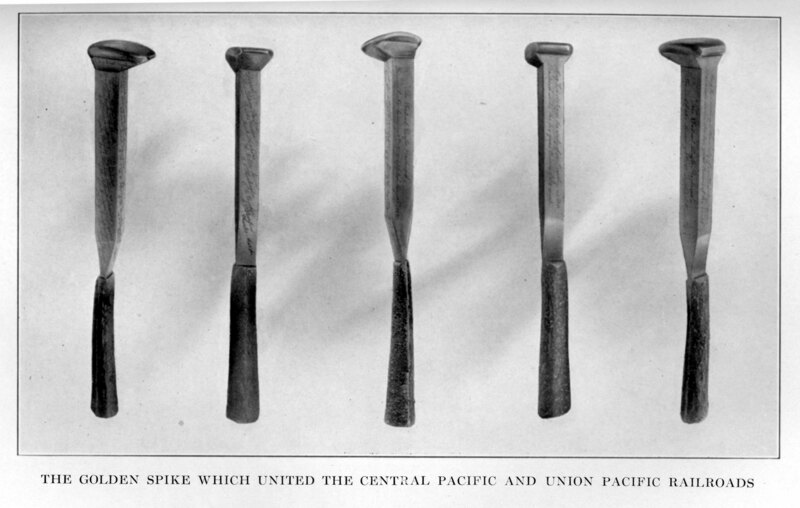 Unfortunately, this is the only such photo in the University of the Pacific Collection, but Robin Lampson's article contains complete transcriptions of the engravings from all surfaces of the Hewes gold spike. David Hewes photograph from the Robin Lampson Collection courtesy of Michael Wurtz, Archivist, Holt-Atherton Special Collections, University of the Pacific Library, (Western Americana). "The lost spike has been found!!!"